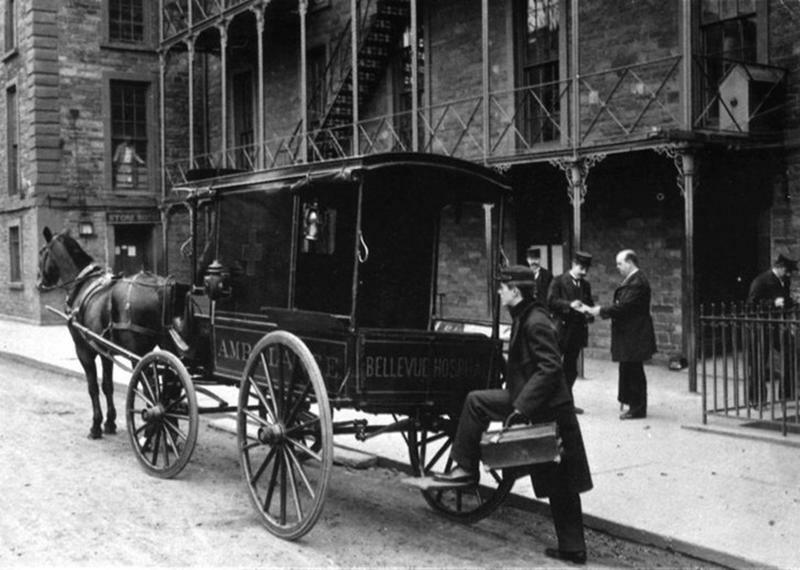 It's time for another journey back in time with these historical images of things famous and obscure you probably haven't seen yet. 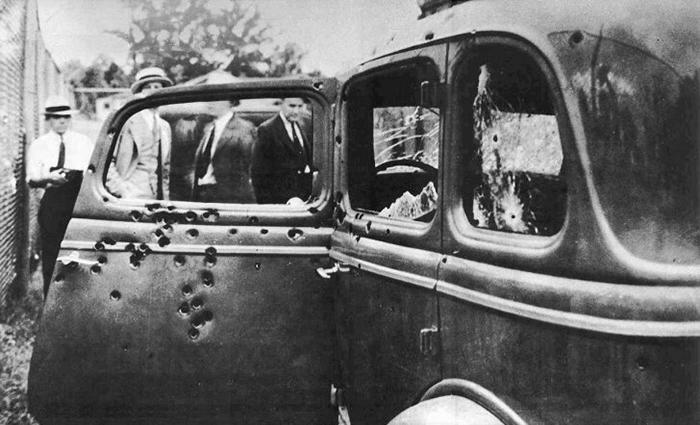 Bonnie and Clyde's car after the shootout that killed the two outlaws. 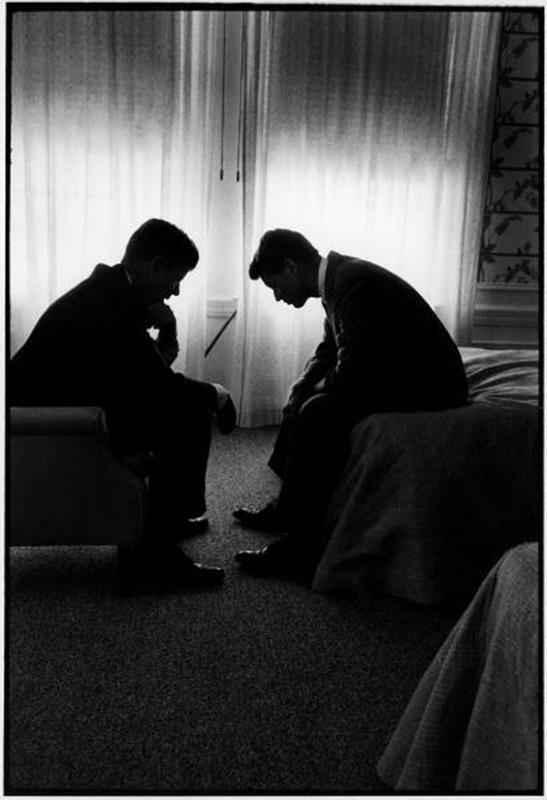 The gunfire barrage was so loud that many members of the posse experienced temporary deafness. 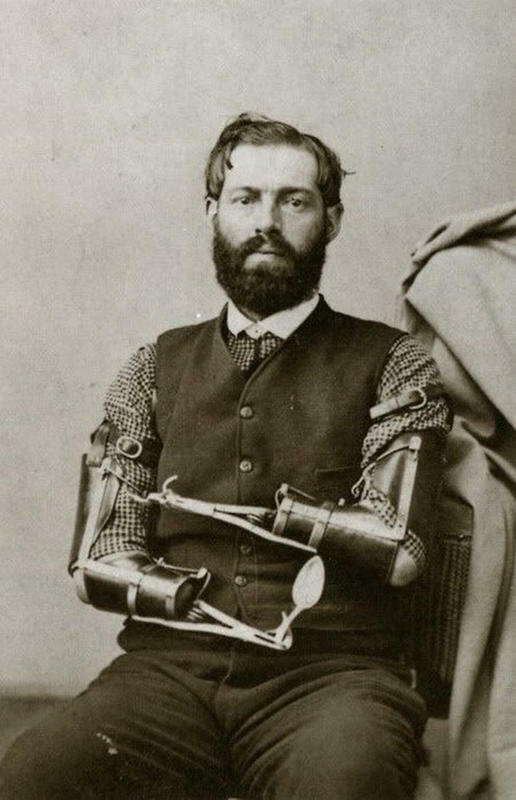 Civil War veteran Samuel Decker posing with the prosthetic arms he somehow made for himself. 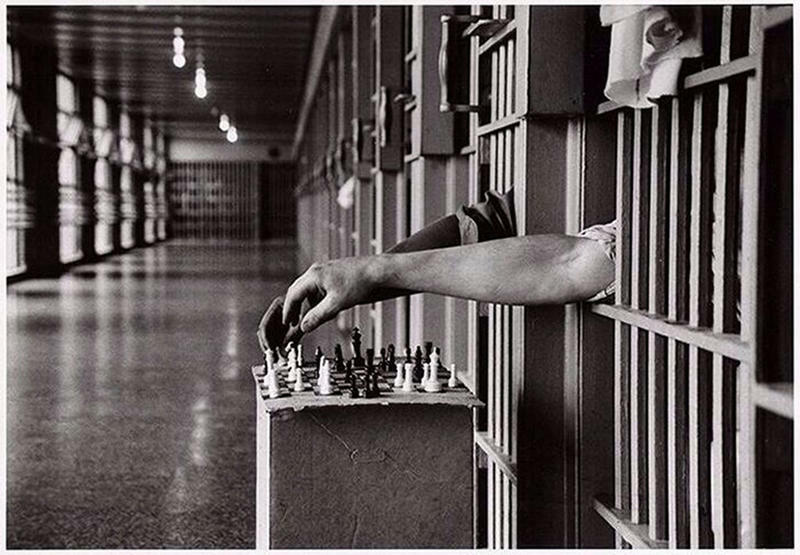 Inmates at Attica playing chess. 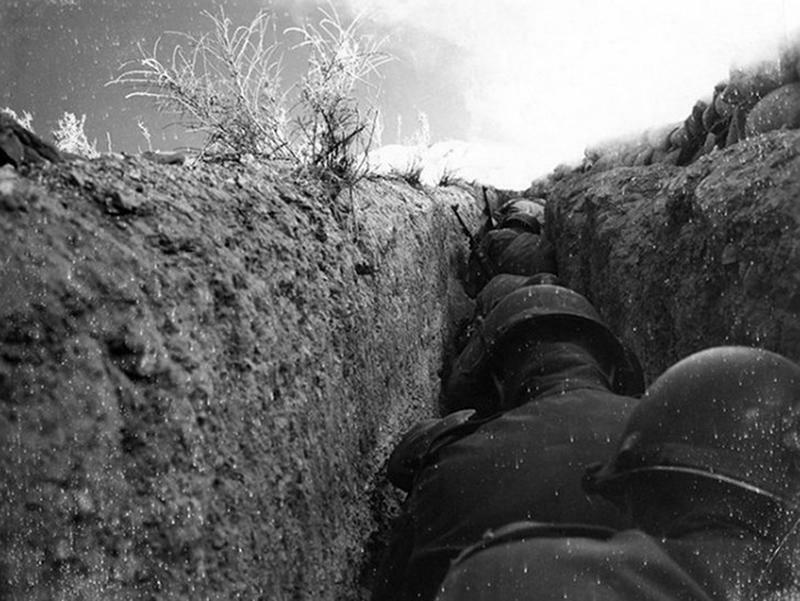 American soldiers hunker down in a trench less than a mile away from the detonation of a 43-kiloton nuclear bomb in 1953. 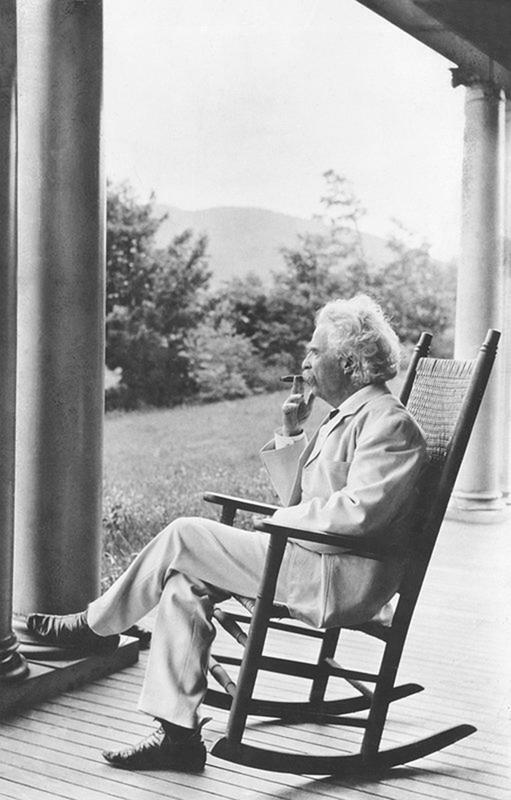 Mark Twain smoking cigar in 1905. 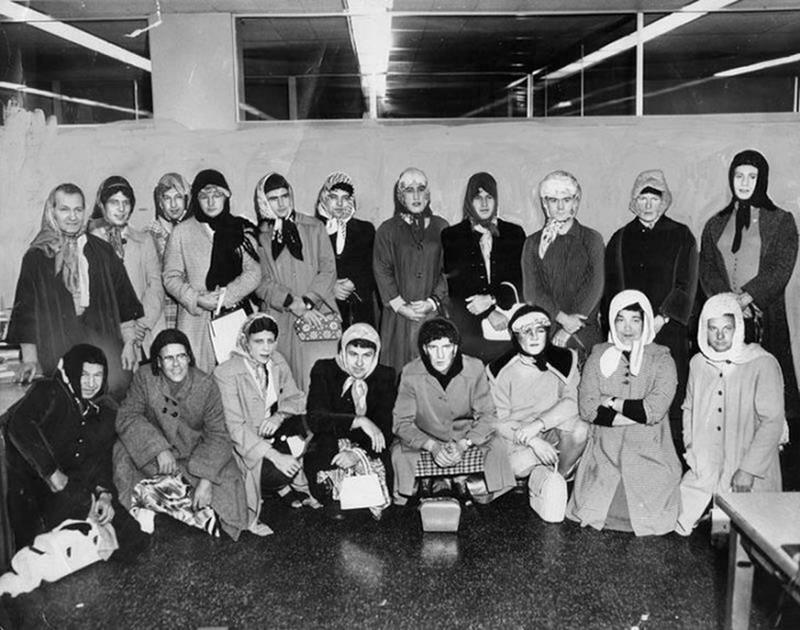 LAPD police officers dressed as women in 1960 to catch purse snatchers. 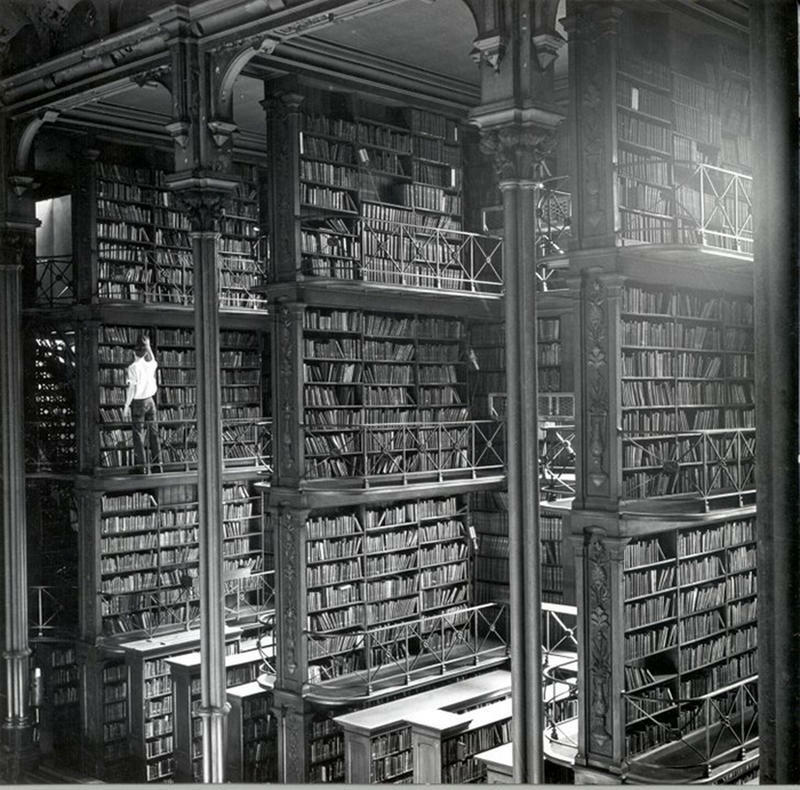 The Cincinnati public library, demolished in 1955. 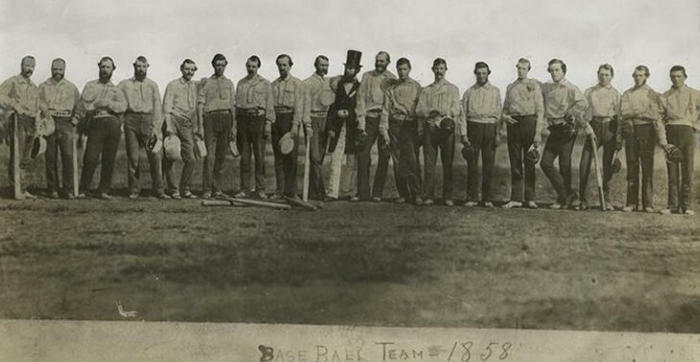 The first known sports team photo ever taken: TheKnickerbocker Base Ball Club, Hoboken, New Jersey, 1858 . 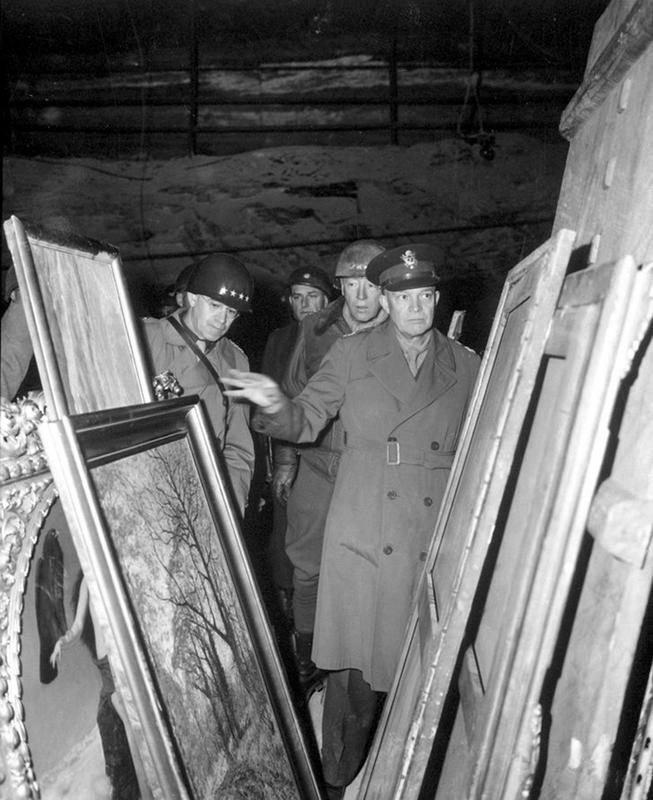 Eisenhower and Patton examining a trove of stolen artifacts that the Germans hid in a salt mine in 1945. 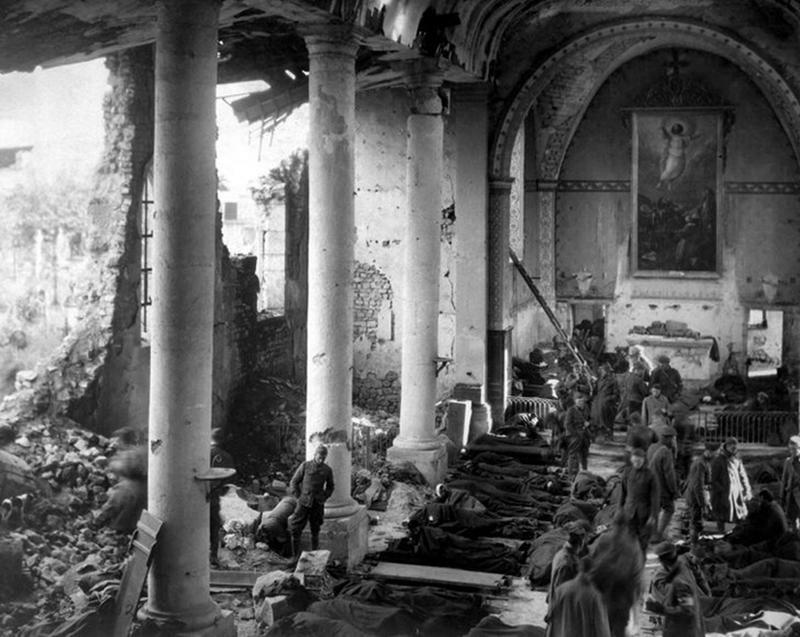 An American field hospital set up in the bombed out remains of a French church in 1918. 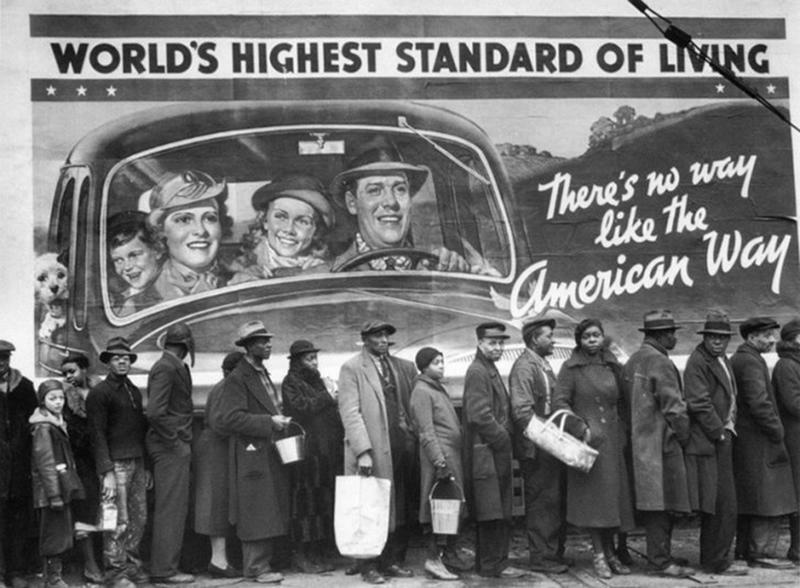 Waiting in line for ration following the Louisville flood of 1937. 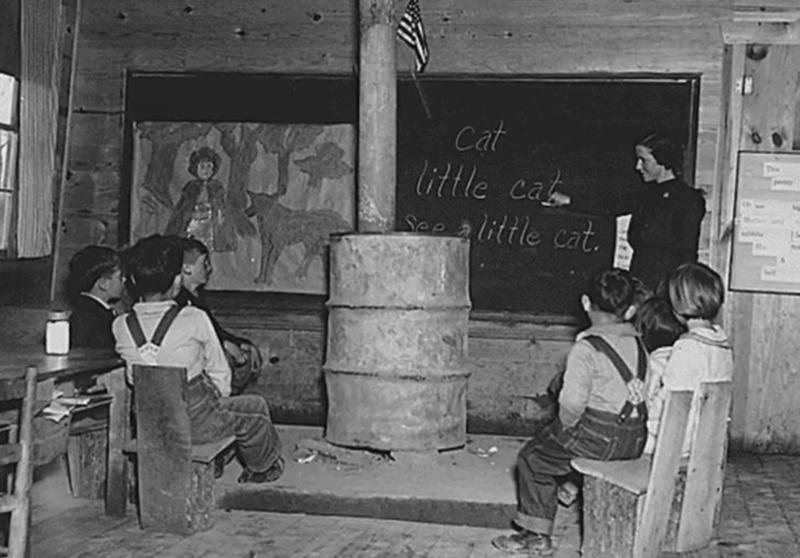 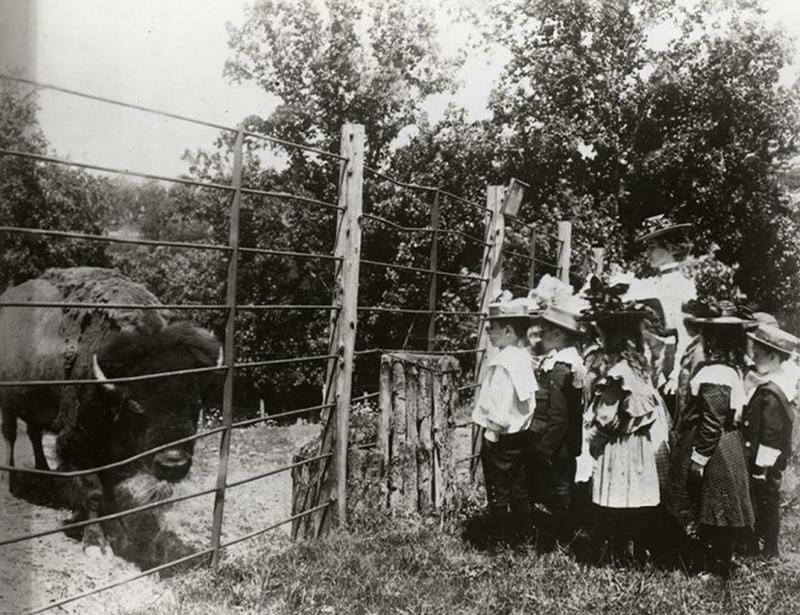 A group of school kids visit a bison in 1899. 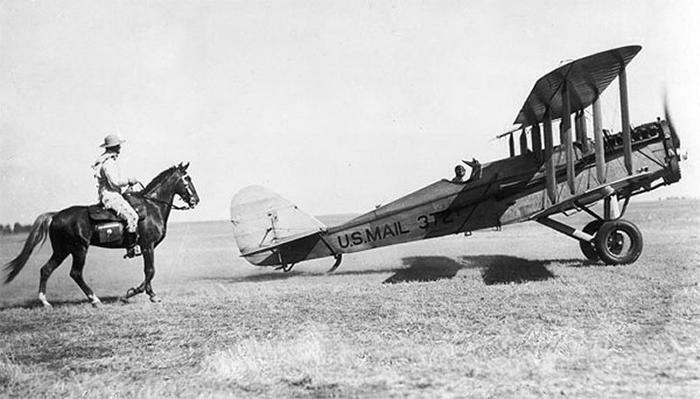 The old Pony Express and the future of mail delivery. 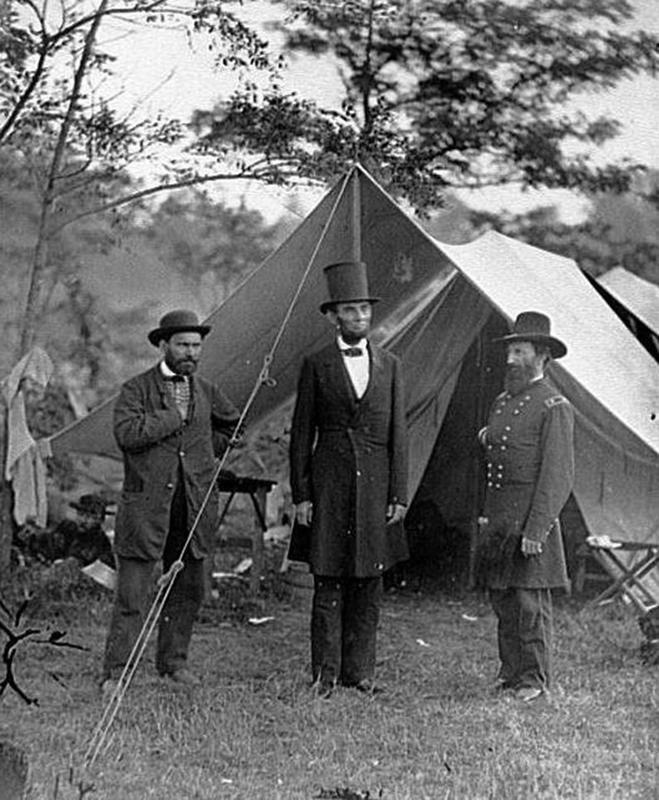 Abraham Lincoln inspecting the battlefield in 1862. 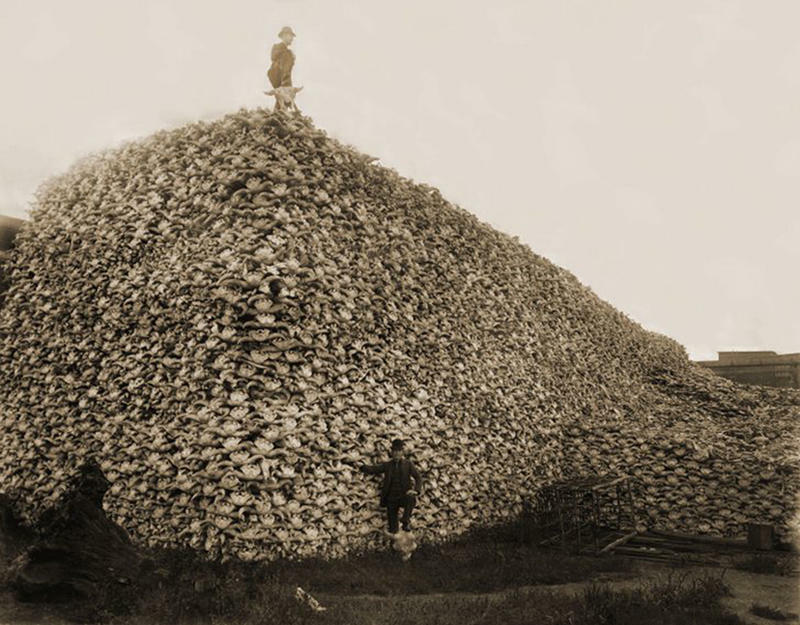 A mountain pile of bison skulls ready to be ground into fertilizer, 1870s. 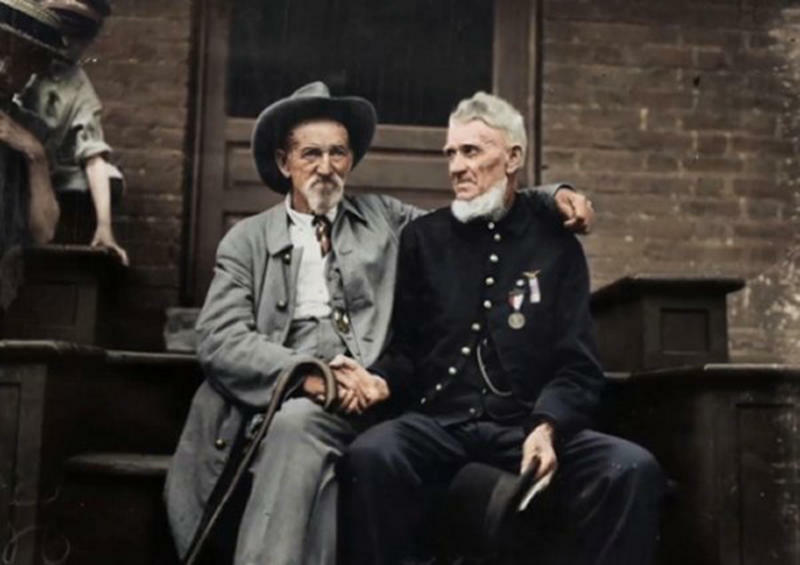 Colorized photo of Civil War veterans and survivors of Gettysburg shake hands in 1913. 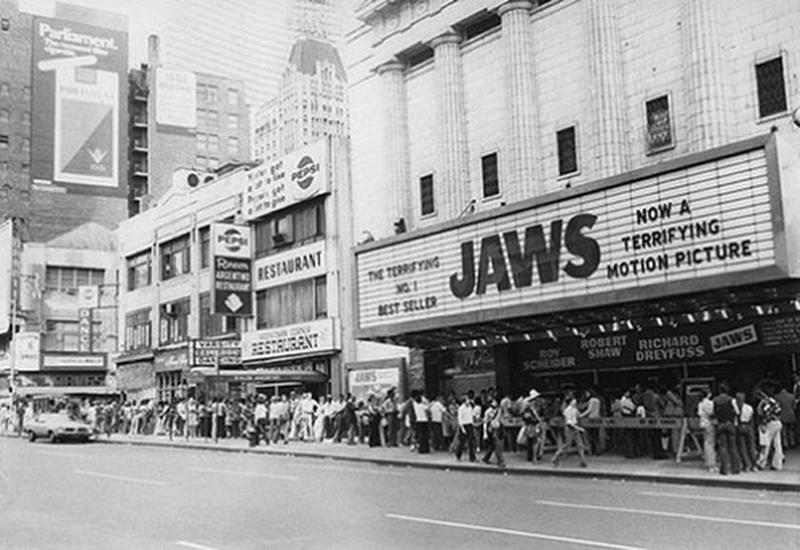 The Rivoli Theater in 1975. 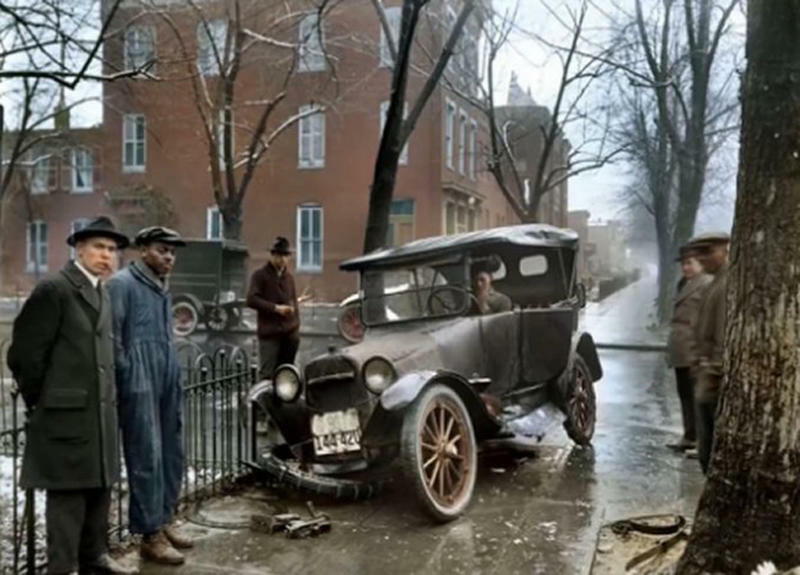 Colorized photo of a car crash in Washington DC, 1921. 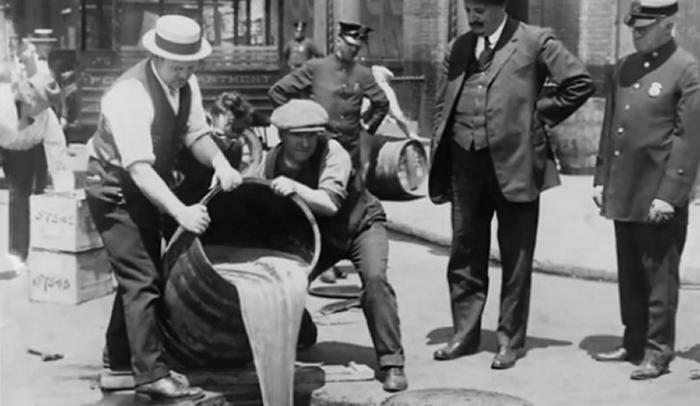 Alcohol is poured down the drain in 1921 during Prohibition. 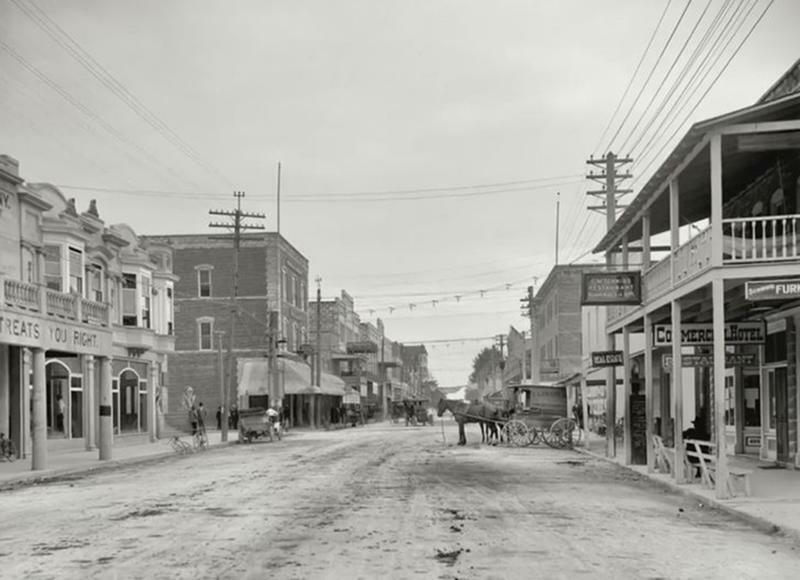 12th Street in Miami, Florida in 1908. 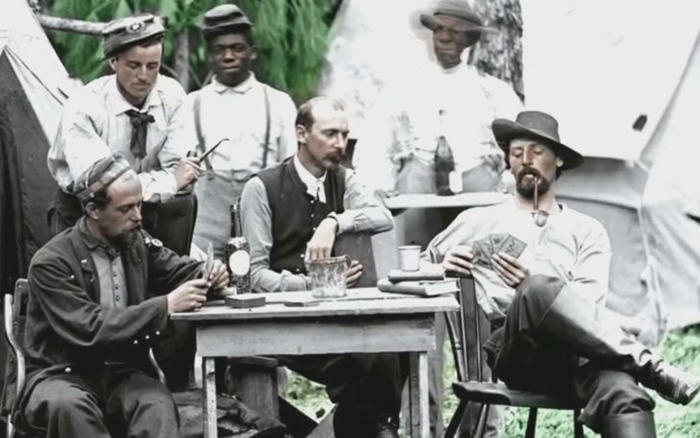 Colorized photo, a lull in the fighting during the Civil War. 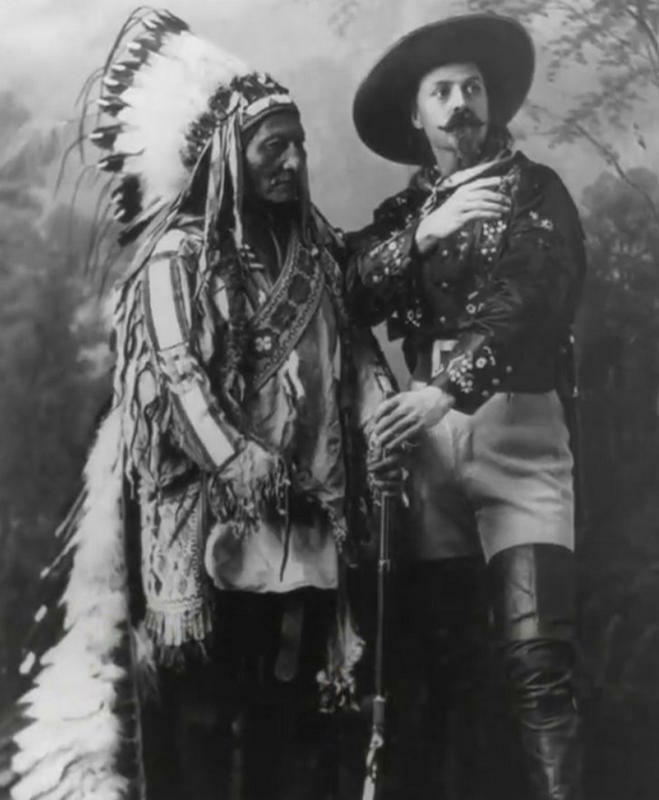 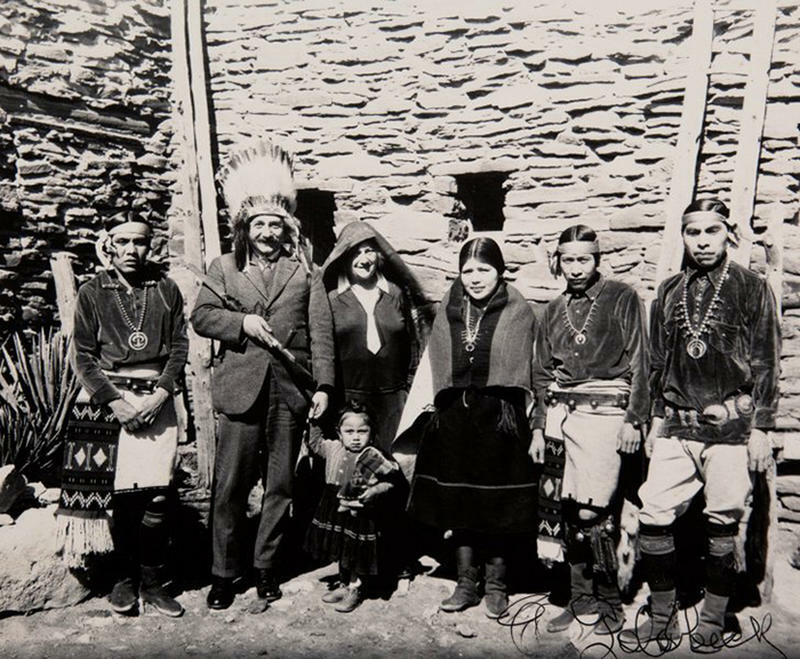 Sitting Bull and Buffalo Bill photographed together in 1885. 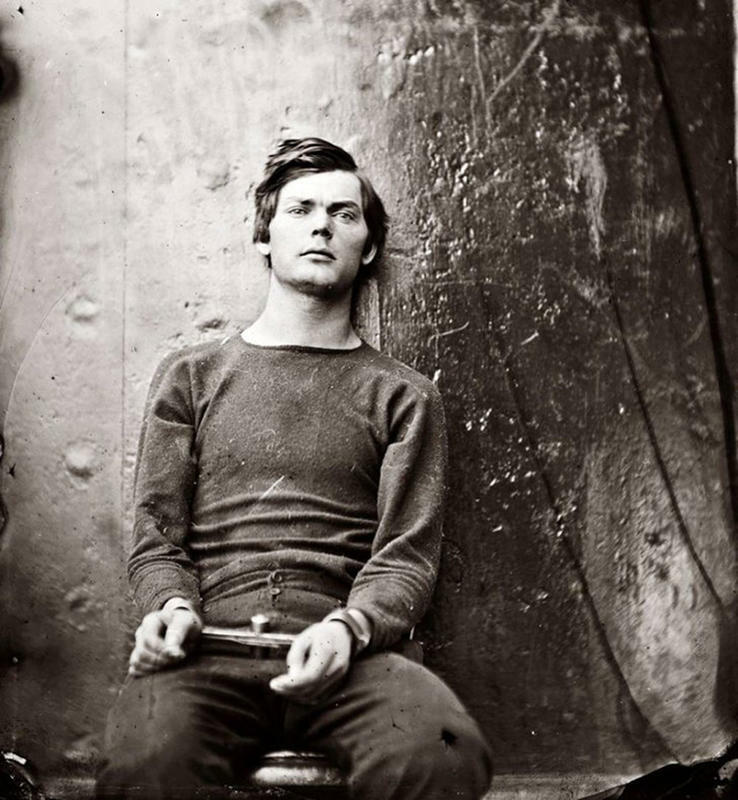 Lewis Powell, a co-conspirator in the assassination of Abraham Lincoln. 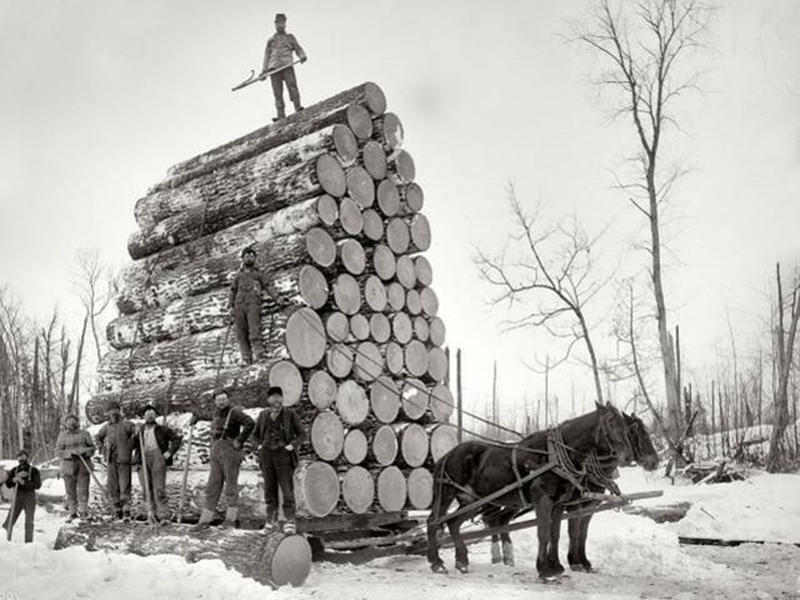 He was hanged in 1865.